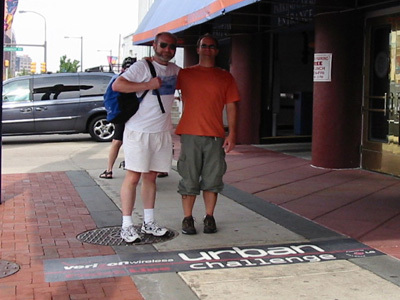 The Urban Challenge was the first urban clue-based running (and mass transit) race that I've hear of and entered. 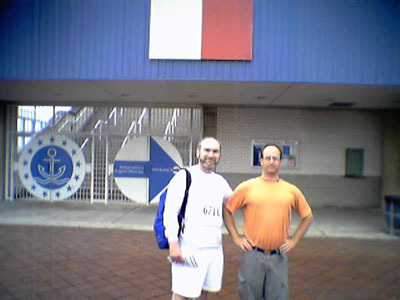 Joe Kemp and I entered the 2004 race in Philadelphia with 74 other teams... and came in 2nd! We just missed a free trip to Miami for the finals! We started and ended at Dave & Busters. Each team received a clue sheet with 10 locations. You could use any means to figure out where the locations were and run there (or use mass transite - no private vehicles allowed!). As we raced from location to location our phone support team assisted us in deciphering the next location. While at each location, we had to take a photo of ourselves using the provided camera cell phone (hence the mediocre photos). A lot of sweaty fun! They had run the race for four years in Philly, but this was the first time I had heard about it. Sadly, the race sort of folded in 2005, but the organizers recently emailed me saying that they would return! Check out www.urbanchallenge.com for all the details.